The SCS is a hybrid clip designed specifically to allow both slide-clip or fixed-clip applications in areas of high seismic activity. Everything about the SCS clip — from its heavy-duty 10- and 12-gauge steel manufacturing to its strategically placed darts to the location of its fastener slots and holes — has been engineered to provide exceptional resistance to in-plane seismic loads. Backed by our real-world, full-scale cyclic testing, the SCS seismic clip delivers the highest seismic loads in the industry. Slide-clip testing shows that attachment at the first slot is most critical to in-plane capacity; the SCS is designed to accommodate two large washer screws (included) at the first slot attached to the stud. The hole types and locations maximize the SCS clip's versatility, with three prepunched oblong slots for slide-clip applications and a pattern of round holes allowing fixed-clip options to meet a range of load needs. The clips come in lengths of 3 1/2", 6" and 8"
SCS32-5 permits 1" max standoff fixed-applications and 1 1/2" max slide applications. SCS62-5 and SCS82-5 max standoff are 2 1/4" fixed-applications and 3" slide applications. Use the specified type and number of anchors. Slide applications: Use the specified number of XLSH78B1414 #14 shoulder screws (included). Install the screws in the slots adjacent to the No-Equal stamps. Fixed applications: Use the specified number of #10 screws (not included) in the designated screw holes. Testing performed in accordance with ICC-ES AC261. A submittal/substitution request for the SCS seismic bypass framing connector for cold-formed steel construction. For additional important information, see General Notes. SCS Allowable Connector Loads are also limited by the SCS Anchorage Load tables below. 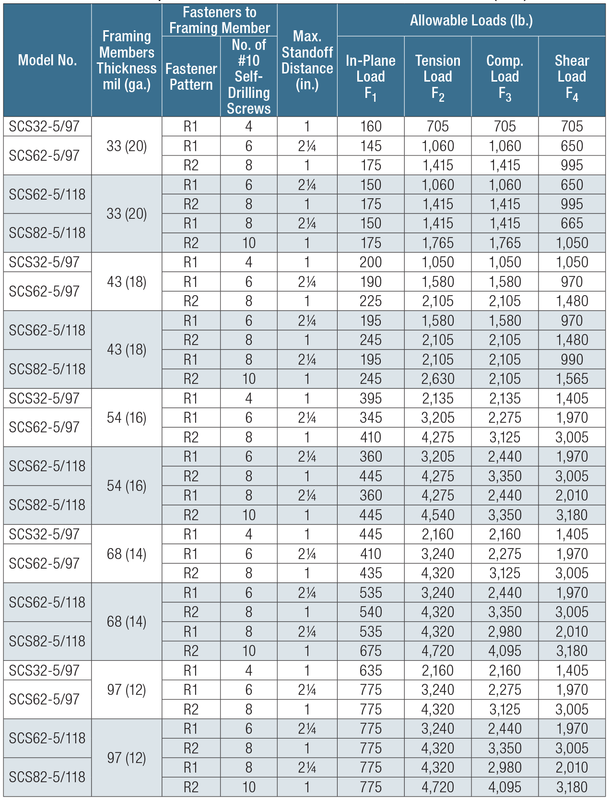 Use the minimum tabulated values from the connector and anchorage load tables as applicable. See illustrations in the image gallery for fastener placement to stud framing. Tabulated F1 loads are based on assembly tests with the load through the centerline of the stud. Tests are governed by fastener connections. F1 loads are based on maximum standoff distances of 1 1/2" or 3" as shown. SCS32-5/97 maximum 1 1/2" standoff. See illustrations in the image gallery for screw fastener placement to stud framing. F1 loads are based on maximum standoff distances of 1" or 2 1/4" as shown. SCS32-5/97 maximum 1" standoff. XLSH78B1414 #14 shouldered screw may used to replace #10 screws in a fixed application. Allowable anchorage loads are also limited by the SCS Connector Loads above for slide applications and fixed applications. Use the minimum tabulated values from the connector and anchorage load tables as applicable. Allowable loads for self-drilling screws and PDPAT powder-actuated fasteners are based on installation in minimum 3/16"-thick structural steel with Fy = 36 ksi. PDPAT values are also provided for A572 steel. Values listed above maybe used where other thicknesses of steel are encountered provided that the fastener has equal or better tested values into thicker steel. It is the responsibility of the Designer to select the proper length fasteners based on the steel thickness installation. F1, F2, F3 and F4 load directions are the same as SCS Connector Loads above for slide applications and fixed applications. 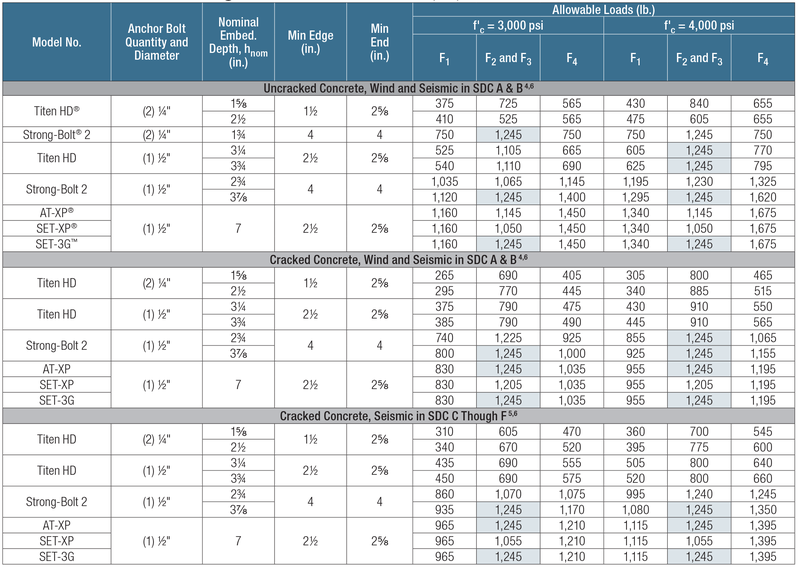 Allowable anchor capacities have been determined using ACI 318-14 Appendix D calculations with a minimum concrete compressive strength (f'c) of 3,000 and 4,000 psi in normal-weight concrete unless otherwise noted. Tabulated values shall be multiplied by a factor (la) of 0.6 for sand light-weight concrete. 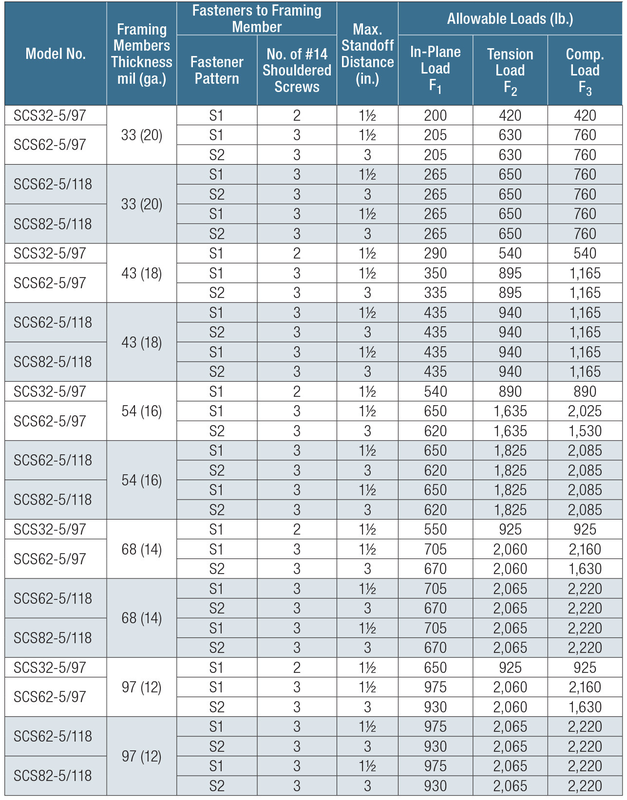 Load values are for group anchors based on ACI 318, condition B, load factors from ACI 318-14 Section 5.3, no supplement edge reinforcement, yc, v = 1.0 for cracked concrete and periodic special inspection. Allowable Stress Design (ASD) values were determined by multiplying calculated LRFD capacities by a conversion factor, Alpha (a), of 0.70 for seismic load and 0.6 for wind loads. ASD values for other combinations may be determined using alternate conversion factors. Tabulated allowable loads are based on anchorage only. The capacity of the connection system shall be the minimum of the allowable anchorage load and the SCS allowable connector loads above for slide applications and fixed applications. Shaded values are limited by connector serviceability and strength in a single fastener anchorage. Na = Applied ASD tension load. anchorage loads to concrete table. Va = Applied ASD shear load.